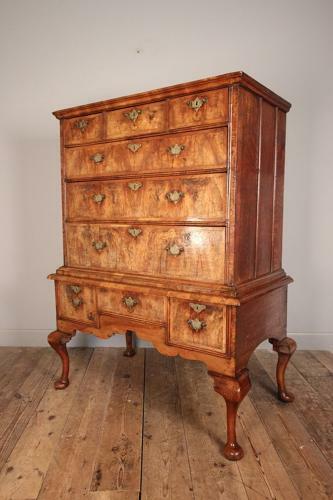 An early 18th century figured walnut chest on stand with exceptional honey colour and rich patina. Having an arrangement of 9 herringbone inlaid drawers, all beautifully Oak lined with period replacement handles and original steel locks. The whole raised on cabriole legs terminating in large pad feet. English, Circa 1720.